Notification No. SOP-II(S&GAD)12-316/06-A is issued by Government of the Punjab services and general administration department section P-II dated 19-01-2017 regarding regularization of contract Employees from the date of initial Appointment. In consequent upon the judgment of Lahore High court Lahore dated 03-09-2015in writ petition No. 6111-14 and orders dated 06-06-2016 of the supreme court of Pakistan in CPLA No. 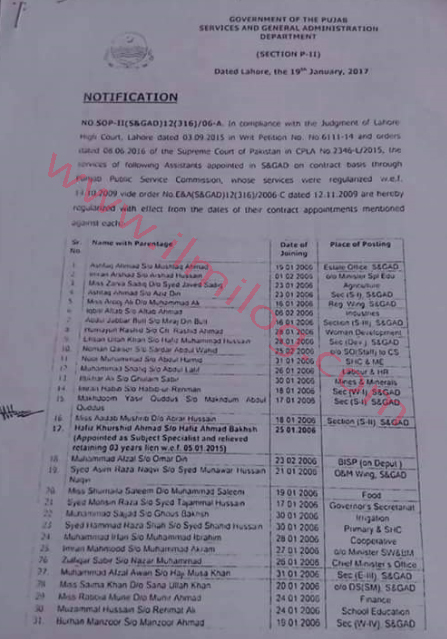 2346-L/2015, the services of the Assistants I appointed in S&GAD on contract basis through Punjab Public service commission whose services were regularized w.e.f 11-10-2009 vide order No. L&A(S&GAD) 12-316//2006-C dated 12-11-2009 have been regulated with effect from the dates of their contract appointment. As per this Notification, Now Educators of Punjab may claim their regularization from the date of initial appointment. Punjab Educators are protest used for the last few time for their own civil liberties like regularization starting the date of initial appointment, however, the government is still scrutiny their show in the schools. These Educators were chosen in 2002 which was their first consignment. Following that, there was successive staffing of Educators in Punjab in 2004, 2006 and 2009. These all educator are regularized from 19-10-2009. This decision was next to these all Educators. Hence they try to go to Punjab services Tribunal. 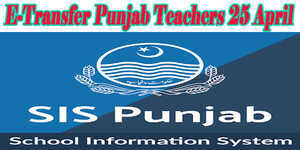 Punjab Educators has decided to contact with Punjab Service Tribunal last year. So Punjab Service Tribunal has resolute now on 27-11-2017 regarding regularization of Punjab contract workers starting the date of initial Appointment. According to the letter of regularization on 03-03-2013, it was decided that Punjab Government Employees will be regularized from 27-02-2015. But at the present, a court has unfaltering to regularize these Punjab Government workers from the date of initial contract meeting. Following this choice of Punjab Service Tribunal for Punjab Employees, Punjab Educators will be clever to apply as per this judgment.